Mon Logistics Services commenced operations when the need of one client presented MON with an opportunity to enter another area of the logistics arena. Expanding from accommodating the need for a modern warehouse by a multinational client, the logistics complex is designed to support transportation, cargo storage and distribution activities. With a total footprint of 168,000 sq.m. MLS is strategically located to offer an ideal platform for both air- and ocean related freight routed goods as well as an ideal base for Bangkok- and boundary distribution for domestic consumption. Our modern, state-of-the-art facilities are designed and built with the use in mind. 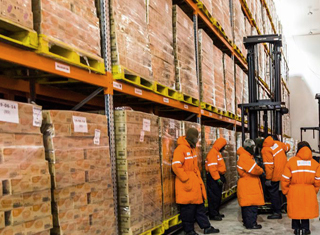 We offer sophisticated multi-room environment-controlled solutions in our cold store with temperature ranges from +15 to -25 degrees Celsius managed in our state-of-the-art warehouse management software. This design affords us the ability to cater to companies with diverse product portfolios. Different individual product groups may need to be separated to avoid cross contamination during storage or different products simply needs to be stored at a wide range of temperatures. Our services are certified HACCP, GMP and ISO 9001:2000, ISO 9001:2008 and OHSAS18001:1999.